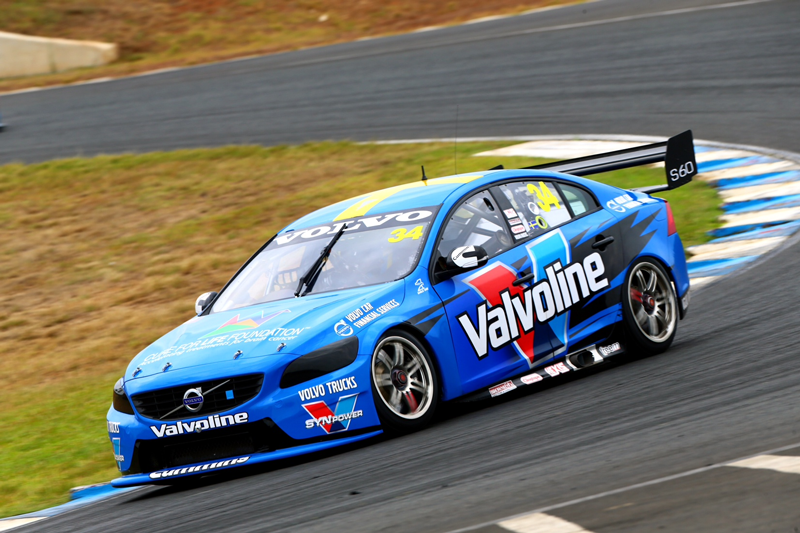 In June 2013 Volvo Car Australia announced that Garry Rogers Motorsport (GRM) would become the base of its factory backed V8 Supercar team, joining forces with its global racing partner Polestar. Featuring a 650 horse power 5 liter V8 developed and built at Volvo Polestar headquarters in Gothenburg, Sweden, the bodywork and aerodynamics of the S60 derived racecar was to be entirely designed and constructed at the GRM headquarters in Australia. The finished product races from 0-100 kph in 3.2 sec and reaches a top speed of over 300 kph. Figure 1: The Volvo S60 Supercar being put through its paces. 2013 marked the 50th anniversary of GRM and our second year working with Pointwise and Applied CCM, Pointwise's distributor in Australia. It was also one of the most successful years in our team's history. The season saw 13 different race winners with GRM claiming two championship race wins. Our exciting young driver Scott McLaughlin became the youngest race winner in the history of V8 Supercars at just 19 years old and he was named Rookie of the Year, finishing inside the top 10 overall. The Australian V8 Supercar championship also underwent one of the biggest transitions in the category's history with the introduction of the Car of the Future formula. 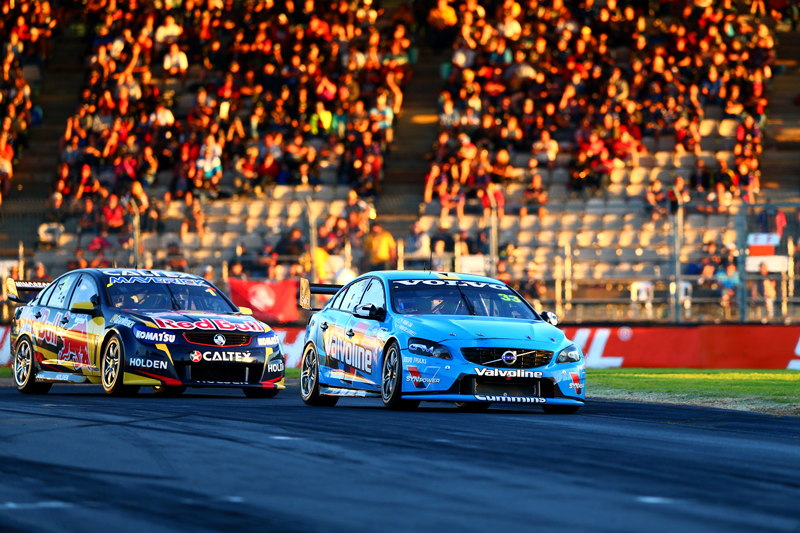 The series has been contested by the Ford and Holden (GM) marques since 1994, but new eligibility rules allowed five automotive manufacturers including Volvo on the grid for 2014, creating a great diversity on the track and increasing the sport's relevance to a worldwide audience. Pointwise has strengthened GRM's efforts by providing the ability to analyze highly detailed full car computational fluid dynamics (CFD) models, especially important because of restrictions on wind tunnel testing in that category. The analysis has given the team a deep understanding of the aerodynamic performance of the cars, a big factor when a manufacturer is seeking to make a flying start in any racing series. Aero performance is critical as the sport requires aerodynamic parity in order to ensure fair and close racing. We were confident of designing a racecar that would meet the category requirements while respecting the addition of four other manufacturers. The efficiency of the finished vehicle required careful consideration of the various components and the effect of their interactions with each other. We prefer to use full car simulations, though they are considered computationally expensive, because we've seen small geometric changes have large effects on the flow regimes around the vehicle. The removal of the file compression during saving operations was an exciting feature change in Pointwise V17.1R2. This gave us a pleasant increase in productivity and maintaining the sanity of the CFD operator when working with large models. Although this is a compromise between file size and speed, storage space is comparatively cheap. It makes good sense to be able to dedicate more time to meshing. Figure 2: An early flow evaluation model. The initial challenge was to understand the external flow around this new body and to find changes that could yield racing advantages. Our understanding of these cars indicated it would be important to develop a concept that promoted a positive wing/body interaction, especially because the wing has a fixed profile across the span and cannot be manipulated to account for flow changes due to the car shape ahead of it. A simple geometry model of the Volvo S60 was created to examine the effect of different wing angles, positions and mounting concepts. Pointwise was able to quickly generate meshes of around 30 million elements and good convergence of these models took eight hours. These early models revealed that the short rear overhang of the Volvo was going to pose an interesting challenge. In this racing category, the competing vehicles are based on large sedans with typically long rear overhangs. 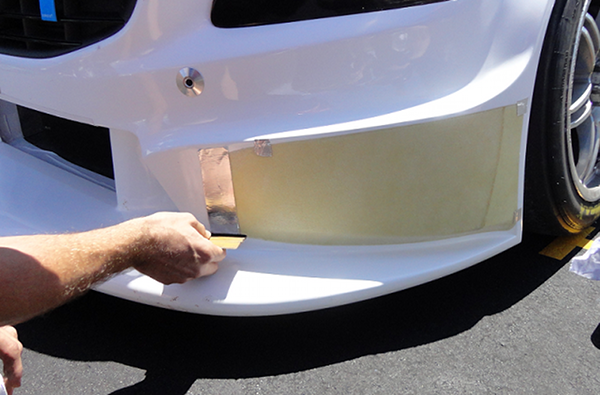 The rear wing's datum placed it far behind the standard S60 trunk lid, so wing efficiency played a key role in the selection of an appropriate mounting solution. Results showed potential efficiency gains of up to 16 percent. The rear end of the car is one of the most sensitive for the flow, so the wing mount design had to keep drag to a minimum, in addition to assisting the wing. Figure 3: The Volvo CFD model in an attitude to replicate straight line aero testing. With a good design direction and with CAD for the car taking shape, we moved to more specific CFD analysis. These models incorporated a highly detailed undercarriage, radiator flow, rotating wheels and moving ground. These models are much more computationally demanding. With changes to our meshing techniques, we were able to cut the mesh sizes by almost 40 percent and using T-Rex (anisotropic tetrahedral extrusion) tetrahedral layers mesh, we captured very good flow resolution. These models were critical in finding the balance of the car to ensure it would could satisfy the mandatory aerodynamic loads and create a racecar that we were confident would be stable, particularly in the high-speed braking zones. Before a new vehicle can be entered in the V8 Supercar championship it must first be homologated, the process of using straight line speed testing to determine the down force and drag loads of the car and matching those of the other competitors. Our CFD pointed to the potential performance of our aero kits and we developed various options for trimming loads and changing the balance of the car. 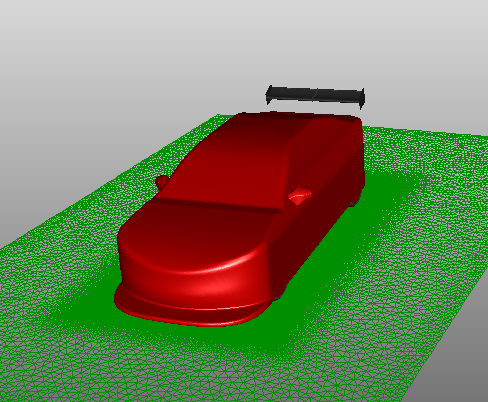 During testing, we found a good agreement between CFD results and the real car. Figure 4: Many solutions investigated in CFD indicated the changes we could expect when developing components to balance the aerodynamics of the car. The Volvo S60 V8 Supercar made its race debut at the Adelaide Clipsal 500 on 27 February, making an immediate impression with competitors and spectators by claiming a front row start and second place finish on its first day. This performance was backed up with its first race win at the V8 Supercars support race for the Australian Formula 1 Grand Prix two weeks later. Figure 5: The Volvo S60 V8 Supercar driven by Scott McLaughlin at the Clipsal 500. 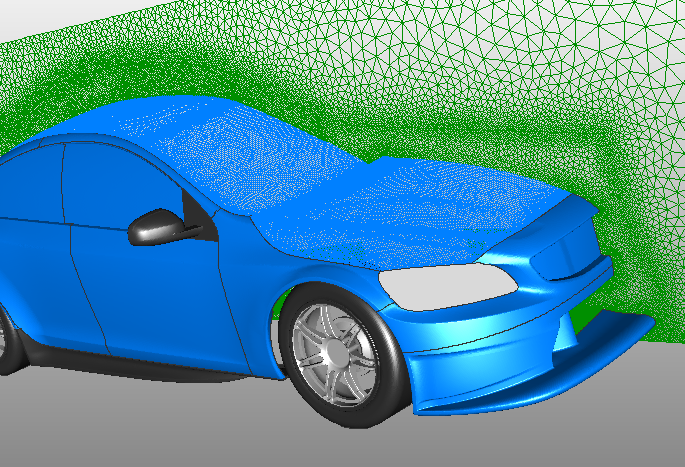 With the help of Pointwise we generated more than 50 full car CFD simulations to test our aero concepts and understand the effect they would have in developing a truly potent racing package. 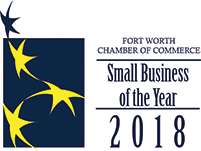 We would also like to thank Applied CCM for their support in achieving the best results from Pointwise and our CFD program.